Earlier today I was reminiscing with a friend about life BC (Before Children). She said “Before kids, my house looked like something out of Home Beautiful!” I found myself nodding sadly even though I can’t remember what my house looked like BC. I have some vague and hazy recollections of fresh flowers in vases and pristine window panes. The words ‘decorative feature’ exist in my vocabulary so I must have had some domestic aesthetic awareness. One memory I do have, clear as my BC window panes, is of the time I was buying a baby bouncer. This was still BC but on the cusp, baby was due in the coming weeks and I was feeling bloated but blissful. Perhaps the bliss came from my complete ignorance as to what was coming my way or it could have had something to do with the effects of the twelve hours sleep I was indulging in each night. Anyway – I remember being in this big baby warehouse admiring all the products and the pastel colours and I was deliberating over this baby bouncer thingy. Oh, I won’t get that one. The colours are so garish. This one’s cute but it won’t match anything in my house. This one’s nice but will it fit in the space between the lounge chair and the pot plant? Eventually I settled on a bouncer that had no musical switches or vibrating features (I remember feeling outraged at the thought of automated rocking bouncers – I would rock my own baby thank you very much! ), a few tasteful dangling toys, an adjustable height lever and a hood. But the most important feature for me at that time was that it was light brown. Seriously – light brown. That seemed important. Why? Because my coffee table and entertainment unit were also – light brown. Ugh – I’m blushing as I type this. The embarrassment. I had no idea! Really we should be alarmed that the midwives handed that baby over. There are no pot plants in my house. Oh maybe one. A cactus thing that’s up high on a shelf and that doesn’t need watering. I think it’s still there. The only time we have fresh flowers in the house is when someone sends them to me. I’m not sure where my vases even are! Next to our tele, where there used to be ‘decorative features’ from my travels in Europe there is ironically, a children’s globe. The equator is peeling off in one long curly strip. Recently I bought a few things to sit on our new coffee table – I got them from the Discount Shop. Cost me twelve dollars. That’s the sort of house I live in now. It feels like a game of Cluedo. The mystery is – Why is there a pair of Size 4 underpants on the coffeetable? Solution: It was Sophie, in the loungeroom, rushing to change into her swimmers. The mystery is – Why is there a blob of Bu-Tac on the vanity? Solution: It was Olivia, in the bathroom after playing schools. The mystery is – Why is there a pile of washing up on the bench? Solution: It was my husband, in the loungeroom, snoring. Here is some photographic evidence. My bedside table. 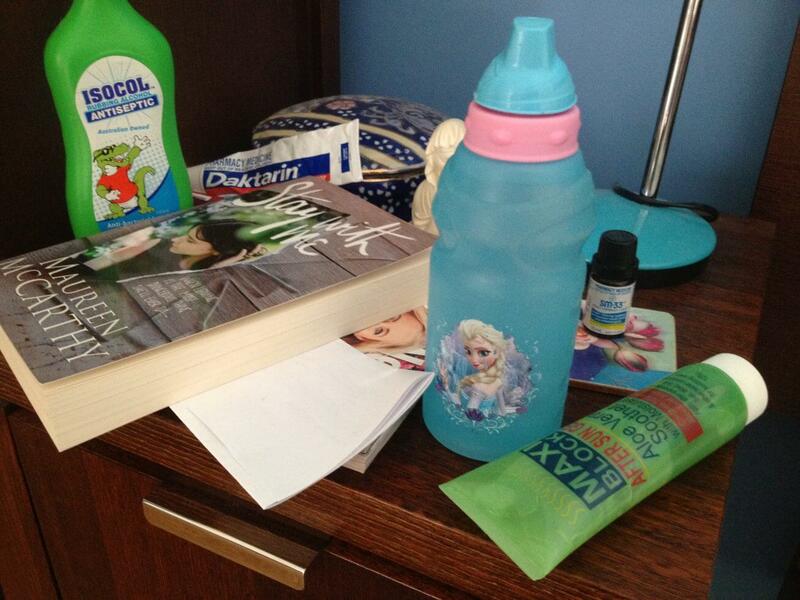 A ‘Frozen’ drink bottle, ulcer gel, fungal cream, antispetic, a school note and a book. Only one of these items was for my use and yet they were ALL on MY bedside table. Notice the dusty ‘decorative features’ pushed to the back. Our kitchen table. My basket and handbag – reasonable things to expect on a kitchen table. 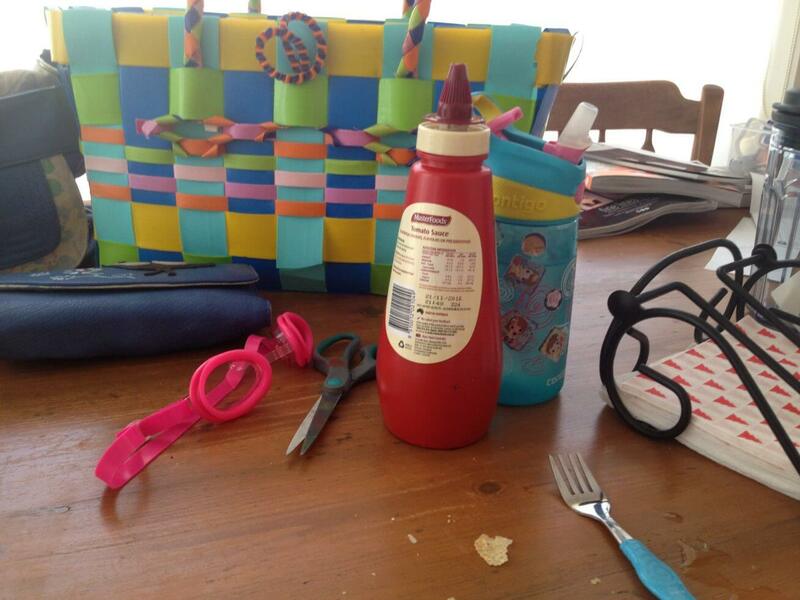 Tomato sauce, a fork, food scraps, serviettes, a drink bottle – pretty feral combo but acceptable for the context. And then… scissors. Why? What for? And to top it off – goggles. Goggles? 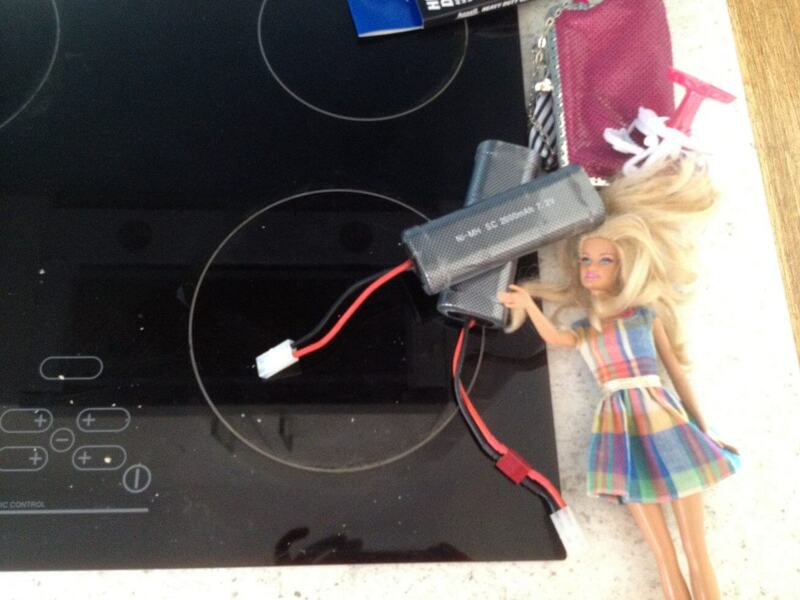 Our stove top. Yep – we like to live on the OH & S ‘edge’. So here we have not one but TWO batteries for a remote control monster truck – safely and sensibly located beside a hotplate. Nearby there’s Barbie, a plastic Barbie chair (or something) and a pink glowmesh purse. Safe to say none of those items belong to me but when I ask someone to clear them away when I have to cook dinner there will not be a single person in my house that will admit to owning any of the above items. And yet it would be unacceptable for me to just crank that hot plate up to nine and watch how things melt down. Our bathroom vanity. Wet swimmer bottoms – size 4. I’ll let that slide but I am wondering what she was wearing on top. A hair clip. Tissues. Hair glitter (don’t ask). A red Christmas bell off a hair clip – is it wrong to chuck that stuff out? And a googly eye finger puppet. Yes – of course. Quite logical. Best place for it. I rest my weary case. Now – don’t leave me hanging. Let’s have some fun with this. Scoot around your house right now and share some alarming combos with all of us in the comments box down below. I love love LOVE hearing from you. Gas cooktop: leap frog reading pen, iPad and iron. Beside it is my empty beer bottle for my sanity. Good combo Kel. I’m impressed. Don’t ever feel you need to justify the presence of our friend Al Cohol. So reassuring to know that it’s not just us! I’m impressed that you clean your wheelie bin – or have the intention to clean it. A couple of empty gift bags?? And a belt…..no idea who’s. ..
Well I do approve! That list paints a nice description of what’s going on at your house at the moment. I love that it’s on your bedside table too. You wake from dreams of grandeur to have an immediate reality check. Reassuring to know that the parents’ bedroom is the ‘hub’ of your home as it is in ours. Our fruit bowl, contains: bananas, nectarines, rotten passion fruit and a lemon…..along with a doorstop, 2 pencil sharpeners, a spanner, an allan key, 2 textas, a pen, 2 pencils, lip balm, gumnuts, 2 lighters(no one even smokes? ), an old scratchie ticket, a tealight candle, a marble, a screw and 20cents oh and one of those rubber bracelet armband things! WOW I am impressed! That’s an interesting combo. So – you could effectively make fruit salad AND fondu while putting together IKEA furniture and completing a school project using nothing but the stuff from your fruit bowl. In the case of an emergency, you should just grab that bowl and run. I think that’s awesome. I never thought of it that way, but yes effectively we can do a lot with the contents of the fruit bowl, I might just add a few nappies, a packet of wipes and then we really will be set in the case of an emergency!